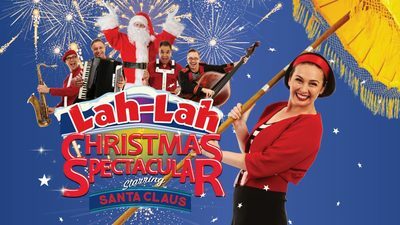 See Lah-Lah's Big Live Band perform at Essendon and Caulfield in a special Christmas themed musical show this December. Lah-Lah’s Big Live Band head to Melbourne with one very spectacular Christmas show this December. The band will tour Sydney and Canberra before heading to Melbourne to perform Lah-Lah's Christmas Spectacular in Essendon and Caulfield. What can you expect from Lah-Lah's Christmas Spectacular 2018? The elves have all stopped working, Mrs. Claus has switched off the cookie oven and Rudolph has run off with the circus. This is a catastrophe of monstrous proportions! Santa is beside himself and, not knowing what else to do, has decided to cancel Christmas. Cancel Christmas! But what about all the children? What will inspire the elves to work? What could bring back Mrs. Claus’ love of baking. How do we get Rudolf off the trapeze and back to the sleigh? Music of course! Lah-Lah’s Big Live Band and Santa team up for a spectacular festive concert to bring back the Christmas cheer, and they need your help. Lah-Lah’s Christmas Spectacular will perform two shows only: 1 December at the Ukranian House and 2 December at the Caulfield City Hall/Glen Eira Town Hall. Glen Eira Town Hall, Caulfield City Hall, Glen Eira & Hawthorn Rd, Caulfield. Sunday 2 December at 10am.